Prior to this tournament, Jelena Jankovic had been in a slump with a 5-4 record. The Serb had been ousted twice this year in the first round at two different events. Jankovic made up for some of the hardship today by beating Caroline Wozniacki 6-2, 6-4 in the finals of the BNP Paribas Open to claim her 12th career title. From the first game, Jankovic demonstrated that she would be taking the driver’s seat and not allow Wozniacki a turn at the gas pedal. When Caroline netted a backhand crosscourt, Jankovic had break point. The Serb converted when the Dane sent a forehand long. After easily consolidating, Jankovic induced a backhand crosscourt error from Wozniacki to set up double break point. Jelena took a 3-0 lead when Caroline had another backhand miss its mark. In the subsequent game, Wozniacki applied pressure and got to deuce, but the Dane could not reach break point. After getting on the board at 1-4, Wozniacki provoked a few forehand miscues from Jankovic to obtain one of the breaks back. However, the next game, Caroline committed three straight forehand mistakes for triple break point, then gifted Jelena the game with a backhand volley error. As Jankovic served for the set, Wozniacki had another break point opportunity, but, with error after error resistance was futile. Jankovic wrapped up the set when Wozniacki pushed a backhand long. In the second set, Jankovic was off again to a great start as a backhand crosscourt pass winner gave her triple break point. When Wozniacki mistimed the forehand, Jankovic secured the break. Then, with a swift service hold, Jankovic jumped to a 2-0 advantage. Although the Danish teenager kept in touch with Jankovic by staying only one break behind, she never manufactured a break point the entire set. Serving at 5-4, with a backhand down the line winner, Jankovic arrived at double championship point. When another Wozniacki return went off course, Jankovic seized her first BNP Paribas Open Indian Wells trophy. After rallying from a 2-5 deficit in the third set in the third round versus Sara Errani, Jankovic was overjoyed to prevail and was somewhat tongue tied during her victory speech; “I am thrilled and happy to win the title”. Jankovic’s tactics of “being aggressive as [she] could” worked to perfection today. With Southern California soon to be her new residence, Jelena said she looked forward to coming back next year to defend. By reaching the finals, Wozniacki will assume the number two ranking, a place previously belonging to Dinara Safina while Jankovic will bump up from the ninth to eighth spot. 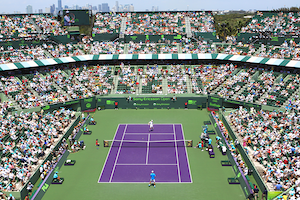 From California, the action will now move to Miami for the Sony Ericsson Open this coming week.